Images. Kevin Lillard's Anime Convention Personalities of the Week. "David & Kimberly"
Exhibited our costumes: Pokémon "Pika Sweet & Charmander"
Image. 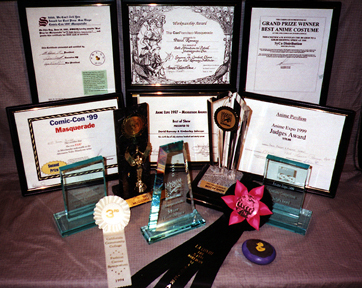 Comic-Con International 1999 Report. "Kikko-Man & Keiko Ramen"
Exhibited our costumes: Pokémon "Poliwhirl & Charmander" and "Pika Sweet & Mr. Squirtle" in the Children's PlayLand area. Image. Update 3. 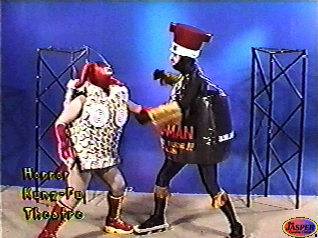 "Pika Sweet & Mr. Squirtle"
Appearance on the Horror Kung-Fu Theatre Halloween Special. "Ramen Rumble"
Trophy: First Place Couple's Dance Contest, presented by "The Nightshadow." 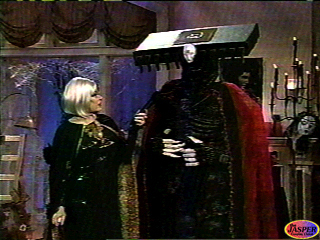 Appearance on the Haunted Halloween Show (aired on 10/29/99). "Z-RAM v.3.0 & Great Saiyaman 2"
Tied for First Place Scream Contest, presented by "Witchy" Roseanne. Image. AnimeExpo 1999 Report. "Pika Sweet & Mr. Squirtle"
Exhibited our costumes: Pokémon "Pika Sweet & Mr. Squirtle" (10am-Noon) and Dragon Ball Z "The Hame-Kame Twins" (2-4pm). Image. AnimeExpo 1999 Report. "Ramen Rumble"
For Costume Most Derivative of, or Likely to Inspire, a Troma Movie, presented by Troma. "Ramen Rumble"
Best Anime Costumes, presented by SyCo Distribution. Article. "Into the Night: Expo-sure to the Art of Animation," photographs by Alex Garcia. "Pika Sweet & Mr. Squirtle"
Images. AnimeExpo 1999 Live Broadcast. "Ramen Rumble"
Trophy: Best Food Fight. "Ramen Rumble"
Judges Award, presented by Anime Pavilion. "Ramen Rumble"
Interview. "Anime obsessives love to live the roles of their cartoon heroes" by Leslie Gornstein. Photographs by Michael Kitada. 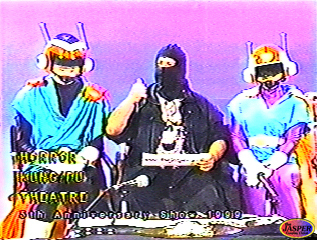 "Pika Sweet & Mr. Squirtle and Z-RAM Bytes the Dust"
Appearance on Sixth Anniversary Horror Kung-Fu Theatre Special. "The Hame-Kame Twins"
Otaku Fan Contest Award, presented by Chibi-Pop Manga. "Hikaru-chan"
"The Hame-Kame Twins", "Mr. Squirtle", "Pika Sweet", "Ramen Rumble", "Keiko Ramen" and "Getta-sneakers"
Copyright 1988~2006 David Ramsay and Kimberly J. Ramsay. All rights reserved.